One of the DalesBus coaches operating in Wharfedale. Picture by Roger Ratcliffe. A few days before Easter, when new DalesBus schedules are rolled out to every corner of the Yorkshire Dales National Park, a head of steam is building for such services to become more regular. The DalesBus routes traditionally start on Easter Sunday and run every weekend and Bank Holiday Monday until late summer. 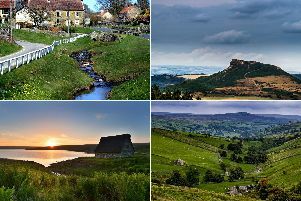 One of them, named the Dalesman, has been described as among the most beautiful routes in England, linking the towns and cities of West Yorkshire with Upper Wharfedale and Wensleydale. A DalesBus service in the Forest of Bowland. At Hawes, it links to another bus, the Ribblehead Ranger, which passes through spectacular limestone scenery on the way to Malham and becomes just one spoke in a wheel of connecting bus routes stopping in Ribblesdale and Nidderdale. Another service, the Northern Dalesman, connects Kirkby Lonsdale and Ingleton with Wensleydale and Swaledale to terminate in the far North Yorkshire outpost of Richmond. DalesBus was set up by carless walkers who were resentful that cutbacks in rural services left most of the National Park inaccessible. Their seasonal services mean they can, for example, travel by bus to the head of Nidderdale, walk across remote fells like Little Whernside and Great Whernside, and catch a homeward connection from Buckden or Kettlewell. DalesBus also means those who do own cars can leave them at home and reduce their carbon footprints when walking in the Dales. A reduced MoorBus service will run this run from May 20. A similar venture called MoorsBus in North York Moors National Park was less successful and ceased operating because of budget cutbacks. However, this year a reduced service will operate from May 20. She argued that Brexit might make the UK seem less welcoming to continental visitors, and we will have to up our game if we want a thriving tourism economy in National Parks. The point has been taken up by the new Bishop of Ripon, Dr Helen-Ann Hartley. Her episcopal area includes the entire Yorkshire Dales National Park.